Please contact owner Paul Email: hankgold24@yahoo.com - or Phone: 732-300-0246. Boat Location: Lacey, New Jersey. Only 500 Hours on Engine, Hydraulic Steering, Power Tilt & Trim, Stainless Steel Prop. Boat is very clean and marina kept year round. 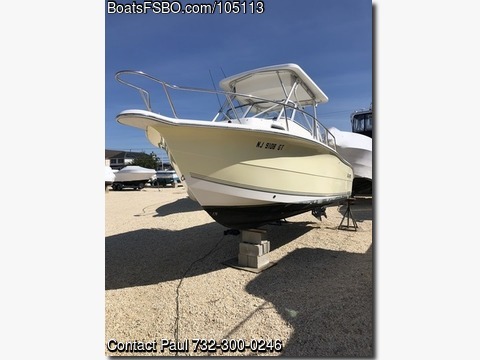 Includes new Simrad GO-7 XSE GPS/Depthfinder in 2018, New Batteries in 2017, New upholstry inCabin, on Helm Seats, Captains Chairs & Side Curtains, Sleeps 2, Porta Potti, Lots Of Storage, Bilge Pump, Coast Guard Safety Package, Anchor, 2 Live Bait Wells, Rod Holders, 5 Rocket Launchers, T-Top, Ladder, saltwater wash down and 2006 Tandem Axle Trailer. Family Owned Since New and Always Professionally Maintained.